Where are you on the Hippie Continuum? | The House of Martins The House of Martins: Where are you on the Hippie Continuum? Where are you on the Hippie Continuum? With the launch of my new etsy shop, The High-heeled Hippie Shop - I thought this Hippie Continuum infographic from One Block off the Grid ("1BOG") would be good to share. I love how it shows reasons why everyone should go solar. I think it does a great job delivering 1BOG's message. If I'm choosing my hippie I'm probably a mix between the Hollywood Hippie and Hippie 2.0. 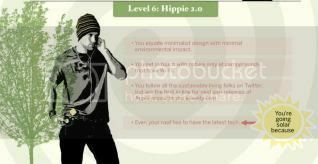 Any readers want to share their level on the Hippie Continuum?